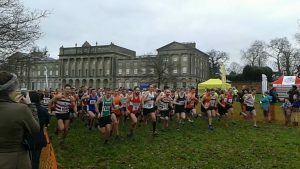 Suffolk XC Championships at Heveningham Hall Jan 2017 (photo credit to Trevor Bunch). It’s all to look forward to this Sunday, with the final XC fixture of the Winter 2018/19 season at Haverhill on 24th March. As a team (Newmarket Joggers + Sudbury Joggers), it must be admitted that our performance is only fair to middling, averaging somewhere around 6th position in the A, B and C divisions of women’s, men’s and combined competitions. Top teams are Framlingham Flyers, Waveney Valley AC and St Edmund Pacers. However, on an individual basis, we have 4 Newmarket Joggers who could walk away with 1st place in their age categories. The individual competitions are based on a runner’s best 4 results from the total of 6 fixtures which take place from November to March. Malcolm Osbourn MV70+ (1st of 6) and Neville Clarke MV65 (1st of 11) have already secured 1st positions in their age categories, with four straight wins as their best four results so far. They could just put their feet up on Sunday while the rest of us plod through the mud. Neil Pollard MV40 has 3 straight wins from 3 runs so far and stands 1st of 31 in his age category. He really needs to finish ahead of Jim Last of Framlingham Flyers at Haverhill to be sure of the win and has every chance of succeeding, having beaten him three times already. Greg Davis MV55 (2nd of 31) is in a more precarious position. Chris Cooke of St Edmund Pacers has won all his 3 races so far and has beaten Greg twice. If Chris Cooke fails to show up and Greg runs to form, then Greg will win. There are trophies for the top three places, so still a top notch season for Greg. Looking at the women’s individual age categories, Jenny Osbourn FV70+ (2nd of 3) has every chance of securing 2nd place trophy for Newmarket Joggers. There are no other female Newmarket Joggers in contention for a trophy. Isabella Soro comes closest in the Female Senior category, currently standing 6th of 21 after 3 runs and improving rapidly. However, a trophy will be out of reach for her this season. Well done to Jackie Hann of our team partners Sudbury Joggers, who should finish 2nd or 3rd of 15 in her FV50 age group. Though the current XC season is ending, the Newmarket Joggers Grand Prix continues through the year from January to the Framlingham XC in November, taking in 5 of the Kevin Henry 5K fixtures on the way. So still lots to look forward to.